A Black Bear's Trail is located in the popular and most sought after Gatlinburg resort community Black Bear Falls. 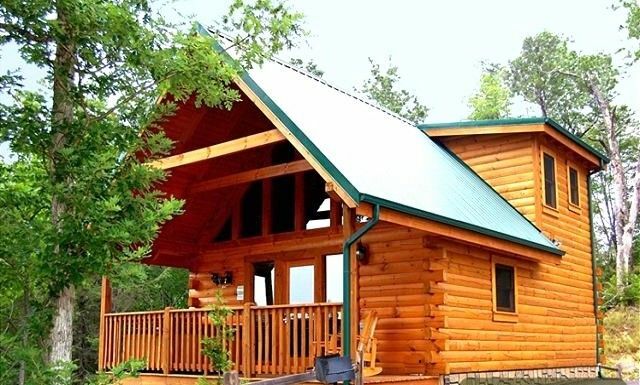 This 1 bedroom 1 1/2 bath log cabin provides all the comforts of home while offering a view that gives any traveler an amazing sense of peace and relaxation. While embracing the front porch mountain views, enjoy a cup of coffee or unwind by taking a dip in the hot tub. Don't worry; it gets better! Enter A Black Bear's Trail and feel the comforts of your home away from home. Curl up on the couch and watch a little tv while staying warm by the fireplace, if it's cold out of course. If hunger strikes, the kitchen offers everything you need to prepare the perfect meal. The upper level loft game room provides a pool table, TV, nine game arcade, and half bath. There isn't a better location than the Black Bear Falls Resort. You've found what you've been searching for in this true log in cabin. We're a family of grandparents, parents and children that love the Gatlinburg area so much that we wanted to own a piece. We wanted a place to enjoy together and to offer to others for the same reason. Our family has shared many great memories in Black Bear Falls, and we know you will too!!! Our family chose A Black Bear's Trail because we wanted a cabin with a view. We also wanted to add a one bedroom to our two and three bedroom cabins here in the Black Bear Falls Resort. A Black Bear's Trail is hands down in the absolute PERFECT LOCATION!!!! You will never have to fight traffic when leaving this resort to run to the store, gas, restaurants. We loved how the cabin is conveniently located to all of our needs. The cabins have been strategically built in a way that offers privacy with breathtaking views. Of course having a breathtaking view which is a definite plus. Let me just start off by saying that I am a total snob when it comes to hotels and such. This cabin is absolutely perfect and above all, it was super clean! The best part of this cabin is the price. It’s priced well below other cabins in the area. You can’t go wrong if you book this little beauty. I’ve already booked my next trip! We had a great time! The cabin was clean and very comfortable. We would love to come again the next time we visit Gatlinburg! Very clean, cozy little cabin! This cabin was pretty much perfect for myself, my husband, and our two small boys. The Pack and Play and high chair that are included are a huge convenience! We loved coming in after a long day of walking or hiking and soaking in the hot tub, followed by a few games of pool upstairs in the loft. Had a great stay. Would definitely recommend this cabin and location. This was a perfect spot for a birthday weekend get away! Very clean and up kept. Close to town but also in a quiet community. We enjoyed our stay tremendously and will be using this community for future stays! This cabin is just perfect for a couple. Its very cozy and has everything you need for a weekend or long stay. The neighborhood is also very nice and walkable, just steep, but that's being in the mountains.